Draumr Kópa: Seven Realms Week - Giveaway! Seven Realms Week - Giveaway! I have a little treat for you guys! 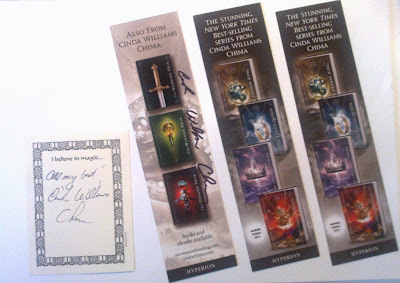 I'm giving away bookmarks (some signed, some not) and signed bookplates! Oh, and let it be clear, guys, I WILL check if you've actually completed all the rafflecopter "assignments". If you earned entries by cheating (as in: not doing what you were suppose to do to earn those entries), you will be disqualified! Yay! Thanks so much, Cindy! Thanks to Cinda also. Can't wait until she finally makes it back to Oregon again.